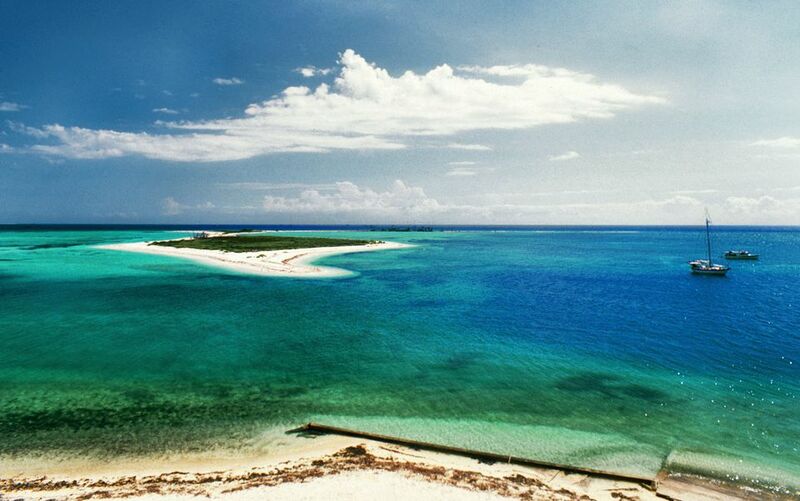 In the Gulf of Mexico, located 70 miles west of Key West, lies a seven-mile-long chain of islands – the centerpiece of Dry Tortugas National Park. As a bird and marine life sanctuary, this park contains some of the healthiest coral reefs remaining in North American shores. The area is also known for its legends of pirates, sunken gold, and military past. The Dry Tortugas derived their name from the great quantity of turtles that can be found in the area. If you’re lucky, you just may spot loggerhead, green, hawksbill, and leatherback sea turtles plying the waters. Spanish explore Juan Ponce de Léon was the first to describe the area in 1513. As time went on, pirates raided sandy lands for turtle meat and eggs. By the time the islands’ first lighthouse was built in 1825, there have been more than 200 ship wrecks in the surrounding reefs. In 1846, the U.S. Army worried that hostile nations could interrupt the Gulf of Mexico’s shipping lanes. It was decided to build a 450-gun, 2,000-man fort on Garden Key. The intimidating structure served as a prison for Civil War deserters. But after 30 years of intermittent construction, the structure was severely damaged by hurricanes. It was permanently abandoned in 1907. In 1935, President Franklin D. Roosevelt named the site a national monument and in 1992, it became a national park. This park is open year-round. Visitation peaks in April and May when the weather is at its best. Temperatures range from the mid-80s to the low 50s. Keep in mind the tropical storm season lasts from June through November. You must take a boat or seaplane to get to this national park. Yankee Fleet runs a regular boat service and can be reached at 800-634-0939. Also try Sunny Days at 800-236-7937. For air taxis and charter boats, call the park headquarters, listed above, or view a PDF of providers. An entrance fee of $5 will be charged per person. Annual national park passes may be used. Fort Jefferson: Take a self-guided tour of the massive structure. At the top, you will find amazing 360-degree views of the area. Garden Key harbor light: Check out giant coastal guns and learn the history of the area. The seawall: along the fort is a .6 mile-long seawall and moat that serves as a fantastic snorkeling area. There are over 442 species of fish, brain coral, and turtle grass to see. Camping is available on Garden Key which offers 10 sites on a first come, first served basis. There is a 14-day limit costing $3 per night. Groups of 10 or more should obtain a permit first which will take 30 days. Biscayne offers a complex ecosystem full of brightly colored fish, uniquely-shaped coral, and miles of wavy sea grass. It is the perfect destination for outdoor enthusiasts who seek aquatic adventures or those tourists looking to simply relax and look out over the bay. Everglades National Park remains one of the most endangered national parks in the country and holds the largest subtropical wilderness in the continental U.S. The nation's first underwater park encompasses more than a hundred square miles of mangrove shoreline, grass flats, and coral reef.